Zorin Group Forum • View topic - Inside swarf's new beast! Re: Inside swarf's new beast! Supposed to be A teaser? What makes Linux great? Windows! What a pain, I did a search on your CPU and Win 7 for fun and got hits on work arounds for updates so likely you find one but still a pain. Micro$oft making everyone do what they want again. Have you got it all working ok yet? Hi MBMz10, Yes it is up and running but I have yet to get Zorin back on. Deciding what to do with my partitions on other drives. I am really liking the fresh look of FerenOS and its Win10 dark theme. Zorin still can't be beat when it comes to usability. For example, Zorin included 802.1 as an option by default for Work based kit so I can connect a Zorin machine to the network without any issues compared to other distributions. I put Zorin 12.4 core on a former Vista Notebook at work which can't be upgraded to Win 10 so I could check the stock of all-in-one printers - Zorin picked up the MG2400 immediately it was plugged in. My main concern with my rig is that the CPU fan off the old board is up to the job and not sure as to what the danger levels are in terms of temperatures. I never OC; to me OC is like revving your 4-stroke motorcycle at 7000 rpm from cold - see how long it will last if you do that! Thanks for the heads up on the work arounds - I'll have to do some more delving. LOL love the revving analogy as I am a dirt bike rider (2 stoke) and and see people do that all the time in the bike unloading area...they love the rev limiter sound, my ears bleed! I got an i5 6600k (the 'k' means over-clockable) CPU for my last build but haven't bothered with OC for reasons you stated and it runs fast and fine in stock trim, low temps power draw etc. As far as I know most modern CPU's motherboards GPU's etc have 'thermal protection' built into them so would likely throttle back or shutdown way before doing any damage, just like engines have rev limiters, so the manufacturer can 'protect' themselves from litigation bad reputation/bad press, fan failures and the like. My hardware was all 10+ years old before the i5 build so it felt like a rocket to use in comparison, puts a smile on your dial for a while. I was going to make it an AMD build but Ryzen wasn't quiet out at the time and the old AM3+ platform had no upgrade future so went Intel/Nvidia. I hear lots of good things about Ryzen and AMD in general so Intel has someone keeping them honest (Gough Gough). Intel has had it their own way for a long time and become greedy along with Nvidia, hopefully prices might come down more as a result, might be good time for cheap GPU with all the crypto miners selling due to low crypto prices? Building PC's is such an interesting thing to do, with most things you just pick the manufacturer options as they see fit, petrol / diesel auto / manual for cars, maybe screen size and some sound options for a tv, the colour for a toaster but you can mix and match so many options (almost too many), then build it yourself, upgrade it later on and even break it if you want! Anyway have fun with the rest of your build process and looking forward to seeing more pics and info as you go. Hey, Nice pics MBMz10! If I showed you my study, it would look more like my Dad's toolshed - you do NOT want to see it! I didn't realise it came with AURA - multicolour changing diodes on the mobo. I mentioned the biking analogy as in our bike club we had a member called Mad Les who had a high powered Honda and leaving the Clubs Rally campsite could be heard revving the engine from cold into the hills in the distance - and that isn't why he got the name of Mad Les - that's another story. I used to be an Approved Motorcycle Instructor with the Star Rider Motorcycle Scheme. When I settled down I gave up the bike (Suzuki GT380 American re-import), and before that I was a volunteer instructor with the RAC/ACU. Happy Days - there is NOTHING like the sheer thrill of riding a motorbike. I remember playing a demo of a dirt bike game on Windows and then I happened to get the full game with a Video Card - how disappointed I was as the full game didn't have the same track as the Demo! LOL! Nice to see CoolerMaster in your rig. Sadly before the debacle of Meltdown, because everyone ranting on about Intel was so good the previous two builds for family members used an i7 Skylake Processor, Asus Ranger Maximus VIII R.o.G. Motherboard and 8 Mb of Corsair RAM and updated the members OS to Windows 7 64-bit and Windows 8.1 64-bit, Cooler Master Gold Modular PSU, and EVGA 4 Gb nVidia Graphics. With my current build I was extremely disappointed to not receive a CPU fan in the box as advertised as they stopped supplying (AMD) cooling fans so all I have been offered is a miserly £5 compensation. I am 'risking' the mobo with the old ASUS RedLion Square CPU cooler shown in the Photo - but found an old article and at the time was more efficient than the then curretn Intel coolers! Just been suggested this! LOL! Well, AMD song was pretty good. Never heard of a GT380 before (only dirt bikes here), but I do like a 3 pot smoker. Yes a 2 stoke on the pipe, love the smell of 2 stoke in the morning or anytime, some of those old oils like Castrol R30, R yes. Well look on the bright side, at least you got £5 back for no cooler, I just got a 'meltdown' patch for CPU, lets hope your CPU doesn't meltdown, I couldn't help myself there. What sort of temps are you getting from CPU? I looked up your cooler (newegg) and it looks like a reasonable heat sink. With a 65W TDP and max temp of 95c, winter coming??? rekon you'll be ok for a while. Ryzen was $44 cheaper, should about buy a cooler. About a year after my build I discovered that the mobo had some issue with sound input from mic, it sounded like rubbish, a bad batch of boards. I got a USB sound card for $5 as didn't really feel like dismantling and being without PC for weeks or months but disappointing as the 'isolated' built in sound card was featured in the bells and whistle section of the advertising blerb. Might have to check Spatry out as it been a while for me. He was a regular when I first started my Linux journey. Oh yes, and you'll laugh when I tell you as a Motorcycle Instructor I had to push a guy on a Honda 250 which was heavier than my 380 - without the rider! Mine was an American re-import so the rear reflectors on the rear indicators (to the side) were red; apart from that, virtually identical. I started my powered two-wheel journey on a Puch Maxi-S - the S standing for rear suspension as there weren't any on the 'N'! A school friend had the 'N' and lost all his panier rack rods above rear mudguard! 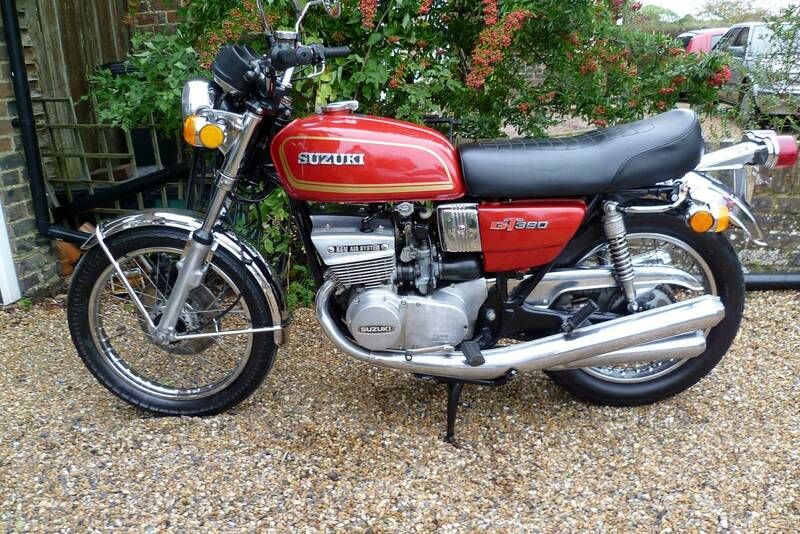 Then I had 3 Suzuki 100's - A, L, then M. The M was a really nice bike - should have kept it as when I looked in a second-hand guide once a few years after loss of bike it was worth more than the 380! You'll like the first 'what music are you listening to link I posted yesterday - just be warned some expletives in the video!